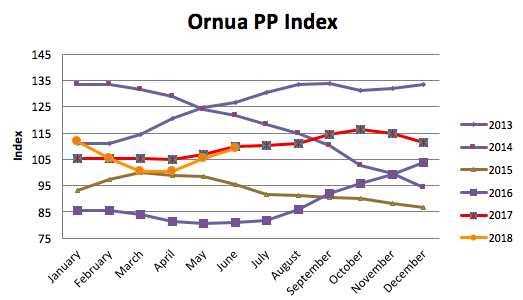 The Ornua Purchase Price Index in June is 109.0, up from 105.4 reflecting stronger returns from butter and powders. After a wet spring, EU milk flows have recovered (+1.3%) as weather improves and milk price forecast is stable. Drought conditions in June and early July is now hitting output. US output is up by +0.8% due to greater yield per cow. In New Zealand, its season ended on a strong note, leading to output for the year being flat overall. Domestic production is marginally down for the period January-May (-0.2%). Trading in butter is quiet, with higher prices affecting demand. Future forecast is weaker, which has given buyers a reason to stand back. SMP prices are relatively stable, although remain below the intervention price, despite the release of stock from public storage. The decision by the Indian government to subsidise up to 65,000 tonnes of exports will not help the market. On 5th July, EU Member States agreed to increase the frequency of tenders selling SMP stocks out of intervention to twice a month. One tender will now be held in the last week of August, followed by one tender in September, and two a month from then on out, except for December, August and September 2019. There has been a significant increase in interest among traders in SMP stocks over the last three tenders, with 24 066, 41 958 and 23 532 tonnes being sold in the April, May and June tenders respectively. Other dairy product markets including cheese remain balanced for the time being.